There are at present two plants in the world operating coal liquefaction processes at commercial scale. The first is operated by Sasol in South Africa and has been operating for a long time. The second has just been opened last year by Shenhua in China. Let's start with South Africa. In the graph above (repeated below), the first data to look at is the red line for 2006 to 2009. 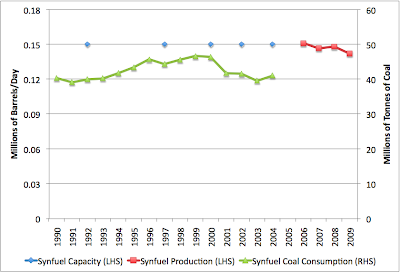 This represents actual production of synfuel according to Sasol's annual reports. The only conversion I had to make was from the millions of tonnes/year in the report to millions of barrels/day. I assumed a specific gravity of the syncrude of 0.86 (specific gravity is basically the ratio of the density of something to the density of water). This is in line with estimates of the density of crude oil. It might be off by a few percent either way, but won't be grossly wrong. The red line is on the left hand scale in millions of barrels/day. You can see that compared to global liquid fuel production of 86 million barrels/day or so, this is small beer. Unfortunately, Sasol only makes their last three annual reports available online, which between them give us four years of production data. To get earlier data, I spent a long time poking around the website of the South African Department of Minerals and Energy. I was not able to find a good annual series for coal to liquids production, but I found two useful sets of numbers that constrain the situation. Firstly, in this 2006 digest of energy statistics, on p30, there is a set of numbers of refinery capacity which includes the crude equivalent capacity of Sasol's synfuel refinery (how much crude it would have consumed to make it's end products if it were starting with crude instead of coal). This will not be more than 5-10% different than the output capacity of the plant (though actual production could have been somewhat less depending on load factor). That data is the blue points in the graph below. As you can see, they are at a generally similar level to the Sasol annual report data for actual production in recent years. Next up, from p28 of the same document, there is a series of the amount of coal used in "Synthetic", which I take to be use for the input for synthetic fuel at Sasol. That data is shown as the green curve (which is on the right scale). I was not able to find a time series for conversion efficiencies of coal to liquid fuel, so I have to leave this in coal terms. The Wiki on Synthetic fuel rounds these up nicely. In his new book Blackout Heinberg says the Chinese have a goal of 225 kb/d by 2020 - at a cost of 2.5 mb/d of water, which is at the upper end of estimates on CTL water demand, and a complete pittance in the scheme of global demand. Shenhua's new plant is producing 22.2 kb/d; bowl me over. Hansen's paper on peak oil seems to have convinced his colleagues that we will seamlessly transition to CTL etc, carrying out scenario A1 if we are so inclined. Aleklett has rightly criticized this, not that we haven't pumped more than enough carbon into the atmosphere to have deleterious effects. It seems to me that, when global crude production peaks, CTL plants will be one of the first solutions vetted to deal with shortages, but citizens won't want to wait 5 years for these plants to be built and move towards personally affordable solutions like EBikes or motorcycles.